Citroen’s first offering for India, the C5 Aircross SUV, will kickstart the carmaker’s Indian innings. Set to launch in 2020, the C5 Aircross will rival the Jeep Compass, Hyundai Tucson and the MG Hector. We’ve got the first glimpses of the upcoming SUV, so here’s a closer look at the C5 Aircross. At 4500mm long, 2099mm wide and 1689mm tall, the Aircross is clearly a cut bigger than its closest rival, the Compass which is 4395mm long, 1818mm wide and 1640mm tall. The C5 Aircross’ face gets a lot of futuristic elements. You get a split grille on the front. The Citroen insignia is in the top half of the grille and is flanked by DRLs on either side. Below that you get a huge grille with horizontal slats, flanked by two dual beam headlamps. On the lower part of the bumper, you get lots of black cladding with twin air dams surrounded by red inserts to give it a sporty look. From the side, the C5 Aircross gets toned down elements unlike the sharp creases seen on SUVs these days. Everything is rounded off here with a C-shaped window line and rounded off wheel arches. The Aircross also gets a black plastic cladding with an interesting shaped red element to add a bit of sportiness. The top-spec Citroen C5 Aircross that was showcased in India recently featured 18-inch dual-tone alloys that fill up the wheel arches nicely. Lower variants of the the India-spec C5 Aircross are likely to get 17-inch alloys. At the rear, the Aircross keeps things simple. Lower down, it gets a huge black plastic cladding to reduce visual bulk, giving it a clean look. The Aircross also gets a boxy rear with an upright tailgate. The taillights have a split LED setup. The Aircross also gets cool looking LED elements in them to ensure they stand out. The C5 Aircross gets a premium dashboard with interesting bits like a sculpted gear lever and dual AC vents. The C5 Aircross might get two interior colour options - All-grey and Hype Brown - just like the UK model. The C5 Aircross will get a three spoke steering wheel with a fully-digital 12.3-inch fully customisable TFT display. On the centre console, the C5 Aircross will get an 8-inch touchscreen infotainment system with Android Auto and Apple CarPlay. Just below the touchscreen are the controls for the infotainment system as well as the air-con controls for the dual-zone climate control system. The C5 Aircross is available with a total of four engine options - a 1.5-litre or a 2.0-litre diesel and a 1.2-litre or 1.5-litre turbocharged petrol - in the UK. Two transmission options are likely to be available. A 6-speed manual or an 8-speed automatic. 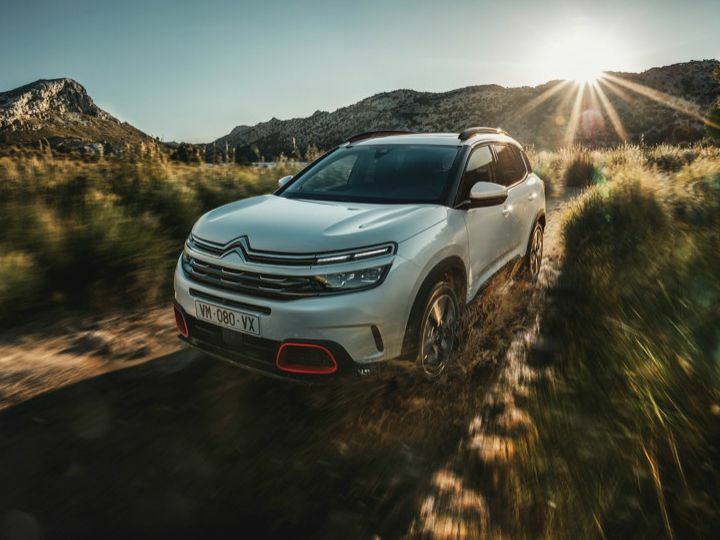 Citroen claims that the C5 Aircross will be the most comfortable SUV to drive in its class thanks to its suspension setup that includes progressive hydraulic cushions. We are unsure if this technology will make it to India though. Other expected features on the India-spec Aircross are keyless start, electric parking brake, park assist, speed-limit and recognition, rear parking camera, and more. The C5 Aircross will be sold via the CKD route initially. Expect it to be priced from Rs 17 lakh to Rs 25 lakh ex-showroom pan India. Eagerly waiting for the new Citroen? Or are apprehensive about buying a car from a brand that’s relatively unknown in the country? Let us know your thoughts in the comments section below. This is a Patton tank in disguise! Certainly not for the narrow Indian roads.Sincerely hope they introduce some thing the size of Creta for the Indian market. This is a Patton tank in disguise! Certainly not for the narrow Indian roads.Sincerely hope they introduce some thing the size of Creta for the Indian market. Share your experiences with C5 Aircross?